Putting forth the question of analyzing the efficacious existence of Unicorns may seem from the onset as a futile exercise in sophistry and as reasonable as this concern is, the quick to the hip counter-argument would be if it does not exist, then how on earth do you even know what I am talking about? Years ago I was venturing to New York to see a Yankee game and I asked a friend of mine — and former New Yorker — to recommend a pizza place that he thought would be a good representation for a first-time visitor to New York. His reply was a cold-stare of silence. Only slightly hesitant, I asked again. Then after an awkward pause he realized and understood both the question and the implication therein. He realized that in my question I am presupposing that there is a such thing as a pizzeria in New York that is not great. And he replied with a smile and said “they’re all great, because if they are not great then they go out of business before they even begin.” This, to me, is a great metaphor for attempting to understanding the connection between the collective-human-agent and the archetype formulation of fiction and mythology — if any such story/fiction was to manifest within the brain of some random person, it would only have the ability to ‘hook-to’ their consciousness if it contains an innate concept of narrative sensibility to which they feel a connection toward. Just like Great Pizza, it is always already there, because there is seemingly no other way to be. And so we begin: Do unicorns exist? The purpose of this essay is to respond to Tim Crane’s theory on nonexistent objects, as he theorizes in the book The Objects of Thought. The purpose of Crane’s project — to which he remarks on several occasions with slightly varying attitudes of conviction — is to “reconcile that there can be truths about nonexistent objects” that do not exist in physical reality (Crane 27). I hold no qualms with the efficacy of the aforementioned quote when it is held in isolation to his project in whole. My discordance to Crane, however, is regarding his process thereof and it is a twofold criticism: first, I believe it is in bad philosophical form and counterintuitive to his project in whole to not make any clear distinctions between different categories of the nonexistent objects; and, secondly, bootstrapped to the previous criticism, once we can make modal distinctions between nonexistent categories, then it will be argued that it is plausible that specific categories of the nonexistent — namely, objects of fiction — could actually exist. More clearly, I will remark that the nonexistent objects of Sherlock Holmes or Unicorns are of a different category than a square circle or the square-root of -1; insofar as the former — characters of fiction, fiction itself and mythology — have a “public” reference (in the Frege method) to which they confer with sensible reality (while also simultaneously not), whereas the latter are merely contradictions in logical systems which are by nature only self-cohering as instrumental methodology and have no “autonomous validity” and, therefore, no epistemological relevance and cannot refer (Nicol 135, 128). Moreover, to begin laying the groundwork, I will posit the following proposition about human nature: it is of both logical and ontological necessity to infer that any and all human projects will always contain — either implicitly or explicitly — the impression of the human ethos. Systems of logic — on the one hand — are exempt from this statement, as logic is only method of object/knowledge organization and it fails to cohere with the human ethos by its inability to logically account for paradoxes (Gödel incompleteness theorem) and falsely attributed justified beliefs (Gettier Problem), for example. Fiction — on the other hand — is a sensible impression of the human ethos and belongs neither exclusively to the “public” (objective world) or “private” (subjective world); or, for that matter, to the sensible nor non-sensible realities. I will further argue that when objects are plotted with their existential status on the X axis and their perceptive sensibility on the Y axis the result will resemble the parabolic curve (inverse ‘U’). Objects on the far right represent objects that are too large for human perception (climate change, history, the universe, et al) — the Timothy Morton “HyperObject” — ; whilst objects on the far left represent objects that are so small (fiction and mythology) that they get flattened, mistakingly so, into the realm of nonexistent — to which I will posit as the ‘HypoObject’. Alas, I theorize: all objects of thought — except non-referring contradictions in logic — exist (positive existential status) and, moreover, because of their low perceptive sensibility relative to the truth-making human agent they will be perceived as equally unreal as vastly large objects and, a fortiori, will share ontological qualities with their hyper counterparts. In satisfaction to these ends I will construct this essay as follows: 1) introduction, 2) analysis of Tim Crane’s nonexistent objects, 3) a description of the Morton HyperObject, 4) an analysis of the differences of Crane/Morton, 5) how this theory engages Frege on “thought” and 6) a final concluding remark. In contrast to prevailing semantic and linguistic theories that grant what is ‘talked about’ and ‘thought about’ equal linguistic and ontological consideration; Crane posits that intentional thoughts (intentionally projected and intentional in their directed singularity) that are “purported” by/in the mind, — but fail to refer — can be mentally organized (sameness and difference) and reside within the constraints of a “psychological reality” and they should be analyzed as such, in contradistinction to any “semantic” or “linguistic” analysis. I will not attempt to exhaustibly deconstruct this thesis, but, rather, I will expand upon the components as they are relevant to our discussion at-hand. The qualities of his thesis to which I take issue with will be firstly summarized and secondly compared to my theorized position. These points are, as called out in boldface, his notion on thought, intentionality and psychologism. Crane paints a clear distinction between himself and Gottlob Frege’s use of Gedanke by illustrating that Frege’s use of the German word for ‘thought’ is to describe the “content of thought” and that this idea of thought is atemporal. Whereas for Crane he ascribes the word “episode” to show a clear distinction between a thought that contains specifically directed spatiotemporal qualities (Crane 140) and one that is general (propositional). These episodes of thought and their capacity to refer (or its failure thereof) could be argued as holding the same formulaic (and applicative) account of Saul Kripke’s “speakers reference” (Kripke 99-102), insofar that it allows the facilitation of having the attribution of intentionality of the ‘speaker’ as a pragmatic resolution to the potential ambiguities of the Russellian definite descriptions. But, however, for Crane we would have to call this reformulation ‘thinkers reference’ and this seen as such holds both the pros and cons of Kripke’s theory. Crane uses the word ‘intentionality’ with the hard-nosed acceptance of the Franz Brentano idiom that all “mental phenomena […] contain an object intentionality within themselves” (Brentano 89) — which is to say that ‘objects of thought’ are self-cohering as they “direct” themselves toward “immanent objectivity” (Ibid. 88) — with the added Daniel Dennett taxonomic distinction that ‘intentionality’ of thought is not to be conflated with physical and natural phenomenon. This is, as it were, the underlining presupposition as Crane quotes Dennett, “whenever we wish to disavow belief in the actual existence of any intentional object, ‘same’ can be at best mean ‘exactly similar in characteristic’” (Dennett quoted by Crane 164) to help him make the point that ‘objects of thought’ can be specifically directed as a intentional episodic notion that contains the semblance of self-cohering internal objectivity within the constraints of its own world (the world of the psyche). And, secondly, he uses intentionality of “singular thought” to draw clear distinction between a propositional and general thought (“propositional content” (Crane 142)) versus a singular and intentional episodic (spatiotemporal locked) thought (“propositional attitude” (Ibid.)). As the former cannot refer, whereas the latter could. Crane spends ample consideration clawing his way through criticizing semantic attribution theories of ‘objects of thought’ to, in sum, render them as insufficient and “hopelessly vague” (Ibid. 157). This helps him carve out the necessity to draw a clear distinction between the realm of semantic/linguistic/ontological theory and that of the “psychological reality” to which he slaps under the label of psychologism (Ibid. 169). It is from this that Crane renders the position that we can intentionally (Brentano and Dennett) focus/attribute our single-term (Quine) thoughts that have the potentiality of hooking-to reality (purporting) (Quine), but necessarily failure as-such when they fail to refer to the reality of things. These nonexistent object of thought do not — which Crane does not mix words about — belong to any special ontological category (Ibid. 4) and, more importantly, he makes it very clear that he is speaking to truths of aboutness of the nonexistent and gives no such credence to their actual existence as “reality does not contain more than what exists” (Ibid. 5). And it is upon these terms and points I will oppose and depart. Morton uses this category as a way of explaining why humans have difficulty understanding climate change as a totality and how that relates to ecological theory. The crux of this meditation is to say that HyperObjects are 1) viscous (they rubs up against and ‘stick’ to objects that are contained within/around), 2) nonlocal (they do not have any locality, as HyperObjects are everywhere at once), 3) large temporality (they are objects that spans more than a single human lifetime), 4) occupies high-dimensional phase space (which facilitates its ability to float in-and-out of human awareness and either stick (viscous) or not) and 5) relates inter-objectively through aesthetic channels (this is to say that the singular term object qua hyper object only relates to humans-as-such through the inter-objective relationship of its internal object-parts and humans sensibly relate-as-such through aesthetic channels of relation). If we examine HyperObjects, as they are relative to the truth-making human agent who dictates the existential point of object reference, it could be argued as such that from the existential human vantage point HyperObjects — like the ‘universe’ for example — can seem to have infinite existential positivity to the same degree that Sherlock Holmes can seem to have infinitely reduced existential negation (nonexistence). Or, in other words, if we plot everything on a scale from 0 to 10, with 0 representing non-existence, 10 representing infinity and 5 repressing the human agent, then it could be the case that the entire universe (HyperObject) could be represented by 9.9999, whereas fictional reality (qua HypoObject) could be represented by 0.0001 and our cognitive ability to render these distinctly polar opposite abstractions falls short in functionality by the same epistemic lacunas. Alas, as I argue, the aforementioned qualities to which Morton qualifies the HyperObject I will posit are also qualifications for the category of the fictional reality to which Crane categorically positions into the umbrella category of ‘the nonexistent’. In the introduction I gave a cursory overview that Crane failed in drawing distinctions between categories within the field of ‘objects of thought’ and for the purpose of brevity, I will only briefly expand on what has already been said. All systems of logic (inclusive of rational, reasonable and mathematical argumentation rendered through logical methodology) are synthetic systems of object/knowledge organization and systematic deployment of thought. Logic as such, is an attempt to structure thought/language in accordance to our observations of the natural world, and given our innate and sensible ineptness, logic make large epistemic leaps beyond the immediacy of our sensible reality — therefore, it should be accepted that our systems of logic will fall short and it is a matter of how and not a matter of if. It is from this that I argue that nonexistent objects of thought rendered as illogical, irrational and unreasonable — in relation to logical methodology of what is logical, rational, reasonable and valid/sound — are completely expected artifacts (remainders) to a system that may self-cohere, but does not exhaustibly cohere to reality, eo ipso. Fiction, on the other hand, is viscous, nonlocal, largely temporal, operates on high-dimensional phase space and it interrelates to humans through aesthetic channels. Ergo, fiction exists to the same degree effect of the ‘universe’ (or God) and they both require a degree of ‘suspension of disbelief’. This does not mean that the story of Sherlock Holmes has been around forever and that the characters are ‘discovered’, but what I do mean is that our ability to connect to fiction is predicated on the reader of fiction being able to sense coherence in the permeating ethos of the human impression that was impressed into the fiction by the creator of said fiction. And, as posited earlier, — it is of both logical and ontological necessity to infer that any and all human projects will always contain — either implicitly or explicitly — the impression of the human ethos — hence, it is not of serendipitously rendered chance that the archetypical story arcs, themes, characters and form of fiction seems to carry a universal character that transcends culture and time. This was, if anything, the overarching point of Carl Jung’s theory of the collective consciousness (Jung 3-5,9). To give some visual illustration to what I speak of (Fig. 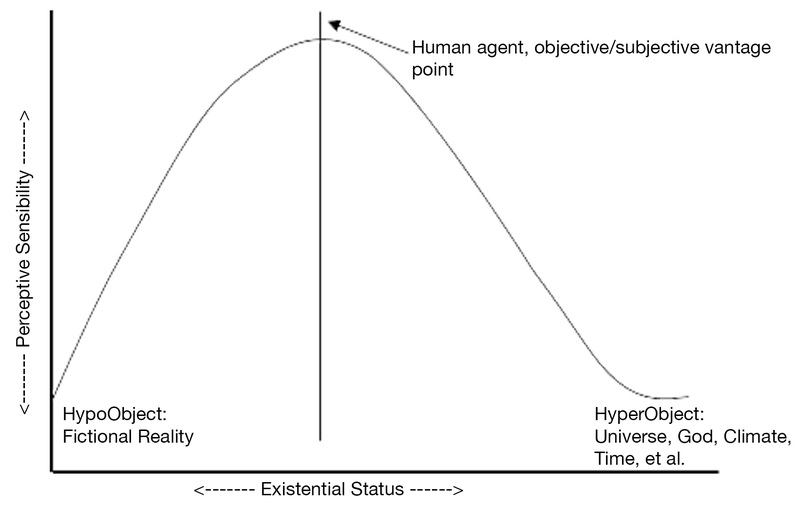 1), this chart illustrates the parabolic curve (inverted ‘U’) that plots ‘existential status’ (X) against ‘perspective sensibility’ (Y) which renders a curve of ‘epistemological potentiality’ as it is in reference to the human agent as the point of epistemological neutrality (point of departure). In other words, as objects — inclusive of fictional objects of thought — move (+/-) from the human agent (vantage point) they shift along an ‘existential spectrum’ (which is always existentially ‘positive’) that also drags them to a lower degree of perceptive sensibility — in metaphor this could be seen as akin to a ‘cone’ shaped object intersecting Carl Sagan’s ‘flatworld’ with large end of cone representing the HyperObject and the cone tip as the HypoObject. Our world, nonetheless, is not ‘flatworld’, but, be it as it may, our limited sensibility is nowhere as thick (rich/deep/complex) as the intersecting cone. To engage with Crane more directly we will return to the four components of the thesis I drafted to illustrate the concerns and differences. Thought: for the most part I take no issue with his distinction between ‘episodic’ and ‘propositional’ thinking, but my criticism lies in the notion that he did not allow this distinction to fully develop into creating categories of the nonexistent thought. Crane could have used this distinction to tightly separate between illogical artifacts of propositional logic and spatiotemporal and contextually rich ‘thought episodes’. Intentionality: my criticism with his usage of intentionality is more of a criticism with Dennett, as I outright reject the dualist notion of creating sharp distinctions between ‘objects of thought’ and the ‘objects of natural science’ as observable and measurable phenomenon to which we can distinctly view as more-so objectively valid than the ‘objects of thought’. I believe it is this presupposition that gives Crane the allowance to start carving out the linguistic/psychologism distinction. I prefer to accept that clear and lucid distinctions in analytic philosophy do not beg the question of instilling duality, but rather they speak to a failure in either our understanding of the human psyche and/or harshly problematic limits in logic. Psychologism: It may seem that under the guise of psychology I am splitting hairs in my resolute championing of a Jungian interpretation of the fictional reality and to much hesitation this is a fair criticism. My criticism in this regard is more of a matter of scope rather than category or application thereof, as I don’t believe the clear catch-all of psychologism fully covers the necessary assessment. I would rather it be seen as belonging to social psychology, philology and/or neuroscience. It is for these reasons that I reject the Crane thesis and prefer to argue with the hard-nosed position that there is no such thing, categorically speaking, as a ‘nonexistent object’ — as objects of fictional reality (aesthetic nonexistence) I would argue actually do exist at least in structural formulation as is illustrated by our ability to connect; whereas objects of logic (illogical nonexistence) only exist because the system of logic, en masse, do not fully cohere with reality and henceforth now and then create logical remainders and this creates the necessity for reconfiguring formal logic and not an open door for creating error corrections. After making my distinction between the illogical and fictional and, henceforth, removing the category of nonexistent it could be argued that I am either a) arguing that fiction lives within the Fregean concept of the ‘third realm’ (not to be confused with the Popperian ‘third world’) and/or that I am granting a spectrum to Being (Sosein) to the same degree and effect that Meinong argued in 1904. However, despite the close resemblance that this essay shares with both of these ideas, I will show how this is not the case in either account. Regarding Meinong, there are two differences to which I will discuss. First, Meinong differentiates ontological modes (Being) based on spatiotemporal qualities — like, for example, an existing coffee cup has one mode of Being, whereas a Euclidean geometry is of another mode of Being (Crane 24-25). It could be seen that my curve (Y axis) may follow in line with what Meinong would view as a curve of Being’ness — but, conversely, as stated the curve only represents epistemological accessibility and has zero ontological status whatsoever. Secondly, Meinong considers ‘objects of thought’ as ‘beyond being’ and are both nonexistent (as is geometry) and of non-being (Ibid. 25). Conversely, my use of ‘existential status’ is of the Sartrean variety that strictly separates existence and essence and I do not presuppose any ‘metaphysical’ or ‘ontological’ qualia within the category of ‘existence’ or in the existential spectrum. The only ontological consideration to which I speak of or brush up against would be the ontological vantage point of the human agent, as any further allowances of ‘ontology’ beyond the immediacy of the curve apex would require suspension of disbelief and would be outside our epistemological scope. 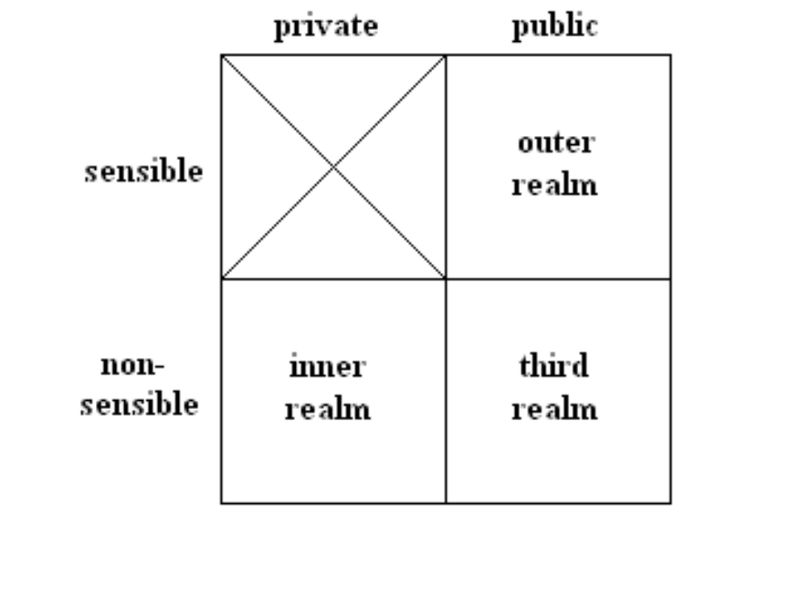 Regarding Frege, in the simplest formulation we could view his three realms as illustrated (Fig. 2) and from this graph easily perceive my rendering of fiction as a universal concept that human agents connect to — as is suggested with the reference to the Jungian collective consciousness — as belonging to the ‘public’ half and the zero-nearing perspective sensibility as holding more of the position of the ‘non-sensible’ as the ‘sensible’. However, there are two problems with applying Frege’s theory to the theory of this essay. First, I need to clarify that when I gave credence to an underlying universal quality of fictional reality, this notion only gives allowance to the form and structure of fiction and not the content itself. For Frege the public category “has no owner” and the private is owned by the subject (Ibid.) and in this sense I could say the form and structure of fiction is ‘public’ and the content is ‘private’. And, secondly, although I do not go into any discursive distinction between ‘sensible’ and ‘non-sensible’, I reject the dogmatic position of the having the limited human sensibility as the metric of existence as either being perceptively accessible and adequate and/or as tangentially dichotomous. However, in some regard I could be seen as a Fregean, insofar that I share the simplistic rendering of Gedanke as either ‘reference’ (truth validation) or ‘sense’ (meaning) and I would be open to perceiving the truth of fictional reality as requiring structural/form validation in its reference to the collective-human-agent par excellence as the ‘reference’ component and, moreover, the content of fiction in it’s private self-owned variant as being in the spirit-of what Frege meant by ‘sense’. To wholly converge these two ideas would require an unhooking of the discursiveness attitude that the nonexistent object is a thing — and in this regard I cannot speak for Frege. I understand that from the onset of this argument of trying to dispel any reasonable efficacy to the concept of the nonexistent, it may seem that I am reveling aimlessly in continental philosophy. But, if it has not been made clear at this point, then I will remark that this position is in sense a skeptic position that gives little consideration for humans having any rich understanding of objects of thought (albeit God, black holes or fictional archetypes) and, with skepticism in hand, I see the logical leap to believe in the ‘big bang’ as equally challenging and tenuous as believing in the underpinning themes of fiction that can be seen cross-culturally. In fact, at least the case with the latter, we can actually take an observational approach to how we view/understand fiction and what is involved in their human-to-human appeal — this cannot be said for many hyperObjects. As for the Unicorn — existence is dependent on what is implied by the word ‘to exist’ and what standards we place upon testing such things; and I assure you that we will find stronger observable data to concur the existence of mythological ‘form’ than the Big Bang, God or Time. Brentano, F. (1973). Psychology from an empirical standpoint. London: Routledge & Paul. Crane, T. (2013). The objects of thought. Oxford: Oxford University Press. Kripke, S. A. (2011). Philosophical Troubles: Collected Papers, Volume 1. S.l. : Oxford Univ. Press. Long, R. T. (2008, October 17). Wittgenstein, Praxeology, and Frege’s Three Realms. Wirth Conference on What Is Austrian In Austrian Economics. Morton, T. (2013). Hyperobjects: Philosophy and ecology after the end of the world. Minneapolis: University of Minnesota Press. Nicol, E. (1965). History and Truth. Los Principios De La Ciencia (Fondo De Cultura Económica), 126-190.